Illinois, located in the north central portion of the United States, is home to roughly 13 million people. 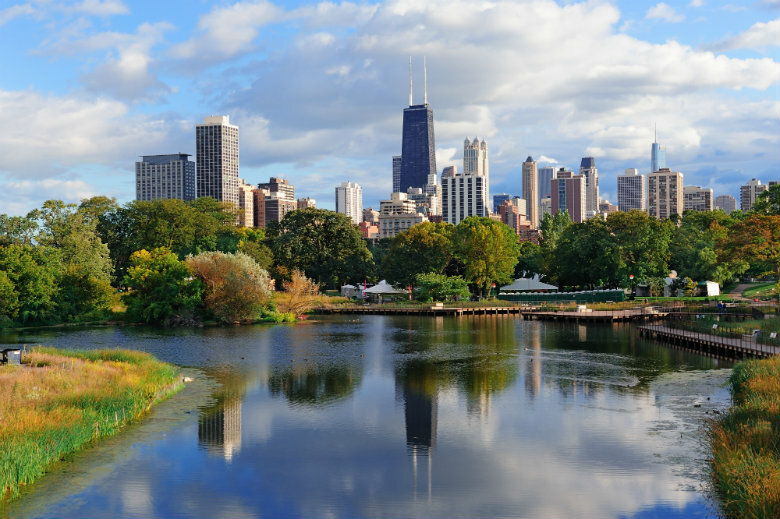 While Chicago may be one of the biggest tourist destinations in the state, there are several other places to enjoy, as well. In general, the state has a very artsy lifestyle. Whether it is in the theater, ballet, painting, or music, you are sure to find some sort of art throughout the state. There are several great reasons to visit Illinois. When making this visit, you will want to use a car shipping company, such as National Dispatch, to get your vehicle to Illinois. Below you will find several of our customer’s top reasons for using one of car shipping services. You are in college. We all know that being trapped on campus, especially at a small school, is no fun. You are in the early stages of adulthood and want to explore your surroundings and go out with friends. However, if you live far away from where you go to school, the drive to campus may seem treacherous. By using our services, you get the best of both worlds. Not only can you avoid a long-distance drive, but you will also be able to use your car to explore your new home. Read more on shipping a car to college. You just got a job. Congratulations on your new endeavor! Starting a new job can be a wonderful experience, but it can also be a stressful one, especially if you are relocating. By using our services, you will be able to fly to your destination to start work sooner, rather than later. You will also not have to stress about getting your vehicle to your new home. Read more on corporate car relocation. You are moving. Moving is a big life change that happens very quickly. There are so many items on your To-Do list that you may not know how you are going to get them all done. You have to pack the house, find a new home, travel, and transport your car. At National Dispatch, we can offer some help in the form of car shipping services. We will pick up your vehicle and transport it to your new home for you. This saves you the extra stress of trying to drive many miles. Read more on residential car shipping. When moving to a new city, there is so many new sights to see, as well as attractions to visit. We have listed a few of Illinois’ top tourist attractions that you must see. Located in the heart of downtown Chicago, Millennium Park offers several different sculptures, architectural designs, and landscape designs. This is one of the most popular destinations in the state. Cloud Gate is the most visited spot in the park. It is a 110-ton elliptical sculpture that is made completely of stainless steel. The steel was used in order to reflect Chicago’s skyline and the clouds. Other popular spots in Millennium Park are the BP Bridge, Jay Pritzker Pavilion, Crown Fountain, and Wrigley Square. Everybody knows who Abraham Lincoln was. If you do not know, he was the 16th president of the United States. Springfield, Illinois was Lincoln’s hometown. Today, his house remains and has become a popular tourist destination. It is owned and operated by the National Park System, but is open to the public for free. Each year hundreds of thousands of people flock to the Lincoln Home to learn more about the man who fought for freedom and democracy. They love learning about Lincoln’s history and seeing where he raised his family and practiced law. This step back into history will be very educational, but also exciting and adventurous. The Discovery Center Museum is located in Rockford. The Museum is one of the top family-friendly attractions in the northern part of the state and has received recognition at multiple levels. This is an affordable way to get you and your kids out of the house, while still being an educational trip. The museum is open every day from 10:00am to 5:00pm and is only closed for major holidays. The museum suggests spending at least a full day, if not more than one, at the site to fully enjoy the exhibits, of which there are over 300. The exhibits are hands-on experiences that focus on the arts and sciences. Guests can learn about color, light, the body, space, electricity, weather, engineering, and more. Kids can dress up and run their own news station, search for dinosaur fossils, and even be on a pretend sports team. When it comes to lunch, there are several spots within the museum where you can have a picnic. There are also several inexpensive nearby restaurants. If you leave the campus for any reason, you can just show your ticket to get back in without an additional fee. Dave’s Down to Earth Rock Shop, located in Evanston, promises to “delight kids of all ages.” Archaeology and geology are Dave’s passion. He opened the shop in 1970 at the young age of 20. Since opening, the shop has grown abundantly with no inkling that it may close. The shop sells a variety of geological and archaeological finds including gemstones, fossils, jewelry, crystals, minerals, and more. The shop’s mission is to provide people with unique items at an affordable price. The merchandise in the store is frequently changing, so even if you have been to the shop in the past, the items will be different when you visit again. The basement of the shop is also a prehistoric life museum with dinosaur fossils on display. Dave and Sandy, his wife, travel the world looking to find special fossils and collectables to bring back to their shop. Do you love arcades and video games? Have you ever wished you could have gotten a higher score on your favorite arcade game as a child? Do you wish to go to an arcade without blowing the budget? If you answered yes to these questions, than Galloping Ghost Arcade, in Brookfield, is the place for you. This arcade is the largest arcade in the entire country. There is just a small cover fee of $20 for an entire day’s worth of playing. This eliminates the need for coins and tokens. This price includes access to over 520 games from open until close. Monday through Friday the arcade opens at one o’clock in the afternoon and closes at two in the morning. On the weekend, the arcade opens at eleven in the morning and closes at two in the morning. If you plan on becoming a frequent guest at the arcade, you may want to consider a membership. These memberships can be purchased in increments of weeks, months, years, or even a lifetime. If you are new to gaming, don’t be nervous. One unique thing about this community of people is that they are competitive, but willing to help and teach one another. After visiting Illinois, you may come to find that it is the place for you. If you are in need of car shipping services to or from Illinois, contact National Dispatch. Request a free, instant car shipping quote. No personal information is required. We can also be reached by phone at 800-321-2051.